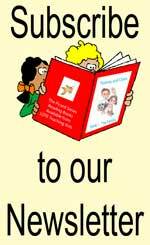 Our Interactive Chart range is great for class activities! Each laminated A1 size chart comes with a set of individual word cards, which students can attach to the chart (using the velcro spots supplied) in the correct positions. 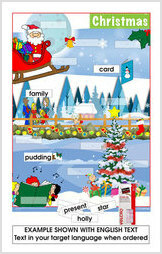 A1 Laminated Chart & Word Card Set (supplied in your target language). A1 Chart is 584 x 841mm printed in Full colour and durably laminated on both sides with Velco Hook Spots already applied in place on the chart. The word cards (in target language) are printed text on 1 side and come with a velcro dot set for you to stick on the back. Have your students then place the cards onto the chart in the correct positions. This is the extended colour title which includes light and dark shades: light blue, dark blue, light green, dark green, light grey, dark grey, light brown, dark brown, black, yellow, pink, orange, white, red and purple. 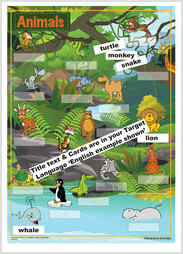 A1 Laminated Chart & Word Card Set (both supplied in your target language - ENGLISH CHART FROM THE SET SHOWN AS EXAMPLE). A1 Chart is 584 x 841mm printed in Full colour and durably laminated on both sides with Velco Hook Spots already applied in place on the chart. The word cards (in target language) are printed text on 1 side and come with a velcro dot set for you to stick on the back. Have your students then place the cards onto the chart in the correct positions. 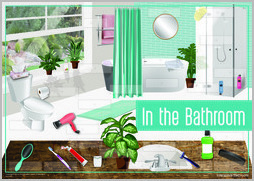 This Interactive Bathroom Set includes: bath, shower, sink, tap, toilet, mirror, shower curtain, flannel/wash cloth, towel, bathmat, soap, shampoo, conditioner, hairbrush, comb, toothbrush, toothpaste, mouthwash, dental floss, lotion, shower cap, dryer, razor, toilet paper and tissue. A1 Laminated Chart & Word Card Set (supplied in your target language). A1 Chart is 584 x 841mm printed in Full colour and durably laminated on both sides with Velco Hook Spots already applied in place on the chart. The word cards (in target language) are printed text on 1 side and come with a velcro dot set for you to stick on the back. Have your students then place the cards onto the chart in the correct positions. Animals include: leopard, rhinoceros, deer, tiger, wolf, monkey, elephant, giraffe, kangaroo, penguin, camel, whale, lion, snake, bear, crocodile, hippopotamus, and turtle. Laminated A1 Body chart - with ALL TEXT IN YOUR TARGET LANGUAGE. 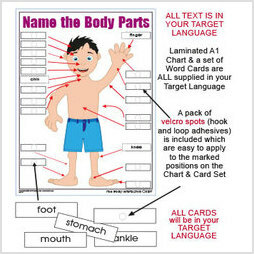 The Title "Name the Body Parts" (is in your Target Language) and a set of individual word cards also in your chosen TARGET LANGUAGE - includes: hair, head, finger, hand, wrist, arm, back, stomach, knee, ankle, toe, foot, leg, elbow, shoulder, neck, chin, mouth, nose, ear & eye. These word cards are easy to attach next to the corresponding arrows to the body part (using the velcro spots provided). 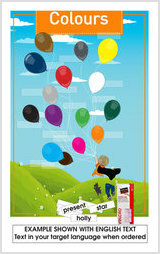 A great class or group activity! Available ONLY in A1 Size. This Interactive Chart is available for Chinese, English, French, German, Greek, Indonesian, Italian, Japanese, Korean, Noongar, Spanish & Vietnamese. A1 Laminated Chart & Word Card Set (both supplied in your target language - example shown in english). A1 Chart is 584 x 841mm printed in Full colour and durably laminated on both sides with Velco Hook Spots already applied in place on the chart. The word cards (in target language) are printed text on 1 side and come with a velcro dot set for you to stick on the back. Have your students then place the cards onto the chart in the correct positions. This set includes: Christmas tree reindeer, elf, Santa, stocking, sleigh, lights, star, bell, holly, candle, preent, card, pudding, carols, tinsel and family. 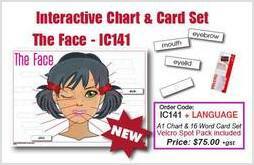 A1 Laminated Chart & Word Card Set (supplied in your target language). A1 Chart is 584 x 841mm printed in Full colour and durably laminated on both sides with Velco Hook Spots already applied in place on the chart. The word cards (in target language) are printed text on 1 side and come with a velcro dot set for you to stick on the back. Have your students then place the cards onto the chart in the correct positions. The Face includes: hair, eyebrow, eyelid, freckles, pimple, cheek, mouth, teeth, forehead, eyelashes, eye, ear, nose, tongue, lips, chin.